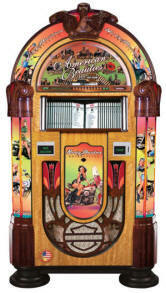 Rock-Ola's Harley-Davidson "American Beauties" CD Jukebox is a popular and iconic jukebox featuring the classic motorcycle brand. In traditional style, the CDs flip right in front of you with the automated CD changer. This beautiful jukebox features illuminated custom-screened glass panels, arch lighting and pilasters, not to mention the original American Beauties - Betty, Dottie, Rita, and Ginny - and their classic Harley-Davidson Motorcycles, in a jukebox like no other. Intricate, expertly-finished woodwork and a molded wood crown and shoulders work to complete this fantastic cabinet. The attention to detail on this jukebox is second to none. 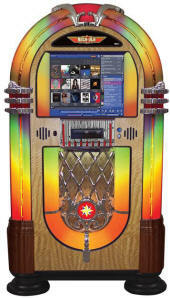 The most popular jukebox of all times has been meticulously reproduced in Rock-Ola's Series IV Bubbler. The Bubbles of air perk merrily to the top of the 8 bubble tubes, while a "kaleidoscope" of colors flows through the translucent plastics. It's the 50's all over again when the changer flips the CD right down in front of you. 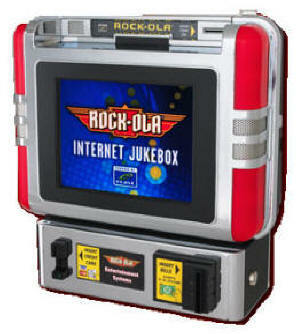 Get the best of both worlds with Rock-Ola’s latest commercial digital downloading jukebox. The E-Bubbler has all the same hand-crafted quality workmanship as Rock-Ola’s traditional Bubbler but it now comes equipped with the latest Ecast Powered technology. Features include: A 15 inch LCD touch screen and instant access to over 200,000 songs, Dual digital amplifier, $1, 5, 10 & $20 bill acceptor and credit card acceptor. The Gazelle features art deco fawns playing the Pipes of Pan above two leaping gazelles etched in mirrored glass panels below. The Gazelles are brilliantly illuminated with ever-changing colors. The front door is finished in burled elm and satinwood. New, "professional grade" Peavey 1600 Watt Amplifier powers up to two volume zones! America’s love affair with freedom and the open road are equaled only by their love for good-ol Rock-N-Roll. 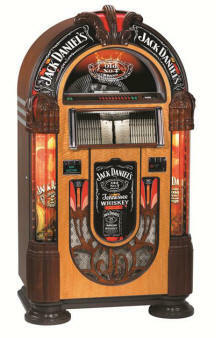 Now you can have it all when you jump on one of these nostalgic, special edition Harley-Davidson® Jukeboxes by Rock-Ola. The companion Mystic is a compact, versatile wall-mount music center with metal cabinet and blue illumination to complement contemporary minimalist home decor. Fitted with a 19-in. touchscreen, and is designed to be hung from a wall with a standard television mount. The Mystic also can reside on a countertop, resting securely on two integral feet. The Nostalgic Music Center is an exciting addition to the Rock-Ola family of finely crafted classic jukeboxes featuring cutting-edge music technology. 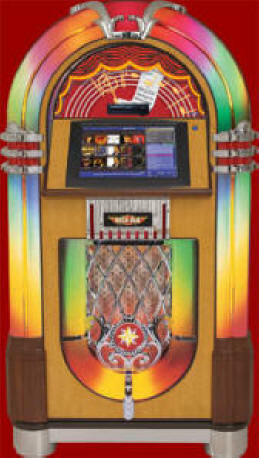 But this is a jukebox like no other. The Nostalgic Music Center is the first of its kind, featuring total touchscreen control of loading, organizing, and playing your CD music selection. 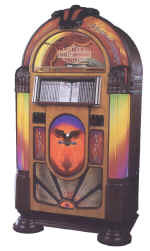 The Peacock is Rock-Ola's top of the line jukebox and includes all the classic features. Six bubble tubes, rotating colors in the side column, and the incredible "polarization of light" in which every feather in the Peacock's plumes changes color independently from the feather next to it. 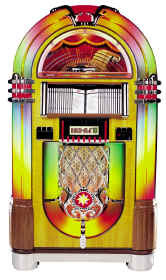 Rare wood, die-cast and chrome-plated accents, pilasters illuminated by moving, changing colors, and the "Auto Magic Touchscreen" distinguish this stylish and feature-loaded jukebox from the rest of the pack. Petite and powerful, the "Q" Table-Top Model is built with the same meticulous attention to detail that the Rock-Ola Nostalgics have made famous. 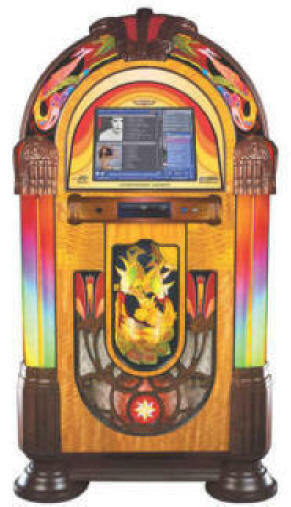 The Newest Downloading Jukebox Powered by AMI ~ Audio by Peavey! 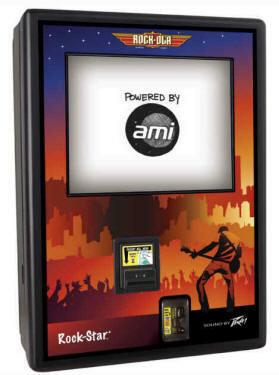 Rock-Star powered by AMI -- the latest addition to our distinguished line of commercial jukeboxes. 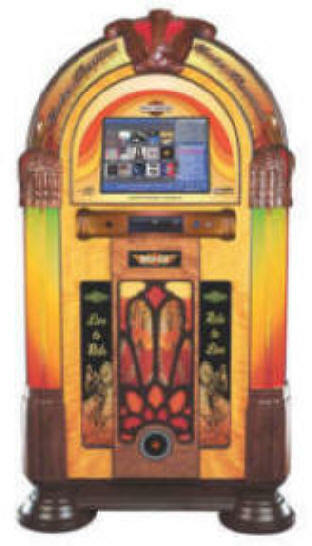 This cost-conscious and space-saving digital downloading jukebox marries Rock-Ola's 80-year legacy of reliability and manufacturing excellence with real economic value. This no-nonsense model has been redesigned from the inside out for even more cost effectiveness than the Rock-Stars that came before. Now featuring an attractive 19" sealed monitor touch screen and economical power and cooling features that really keep operator costs down. Peavey audio system and AMI broadband music service really push up the profits! 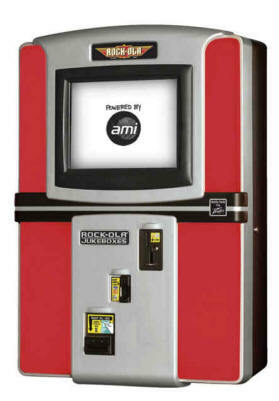 Celebrating All new content provided by the AMI Network for the Smallest & Most Powerful Jukebox Ever! 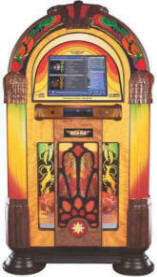 The new Rock-Ola “Slimline” is the smallest free-standing commercial jukebox on the market today, with a mere 20” x 30” footprint. At a bit over 5 feet tall, the generous 19” touch screen is visually and practically balanced for optimal attraction in the streamlined façade of the cabinet. Another innovation incorporated in the new Rock-Ola Slimline is the unmatched-for-power sound system designed and tuned exclusively for this model by Peavey. This retro diner-style beauty will play all your favorites from any room in the house through its own stereo speakers or any RMC jukebox. Real chrome-plated die cast metal cabinet with lighted plastic pillars. Lit selection buttons and its own stereo speakers. 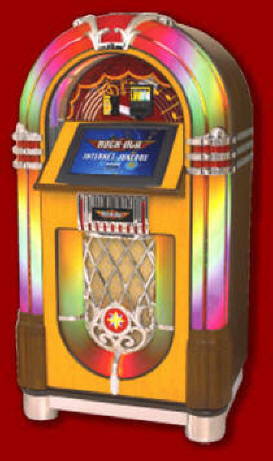 Holds 50 or 100 title cards and connects to any Rock-Ola SyberSonic jukebox. 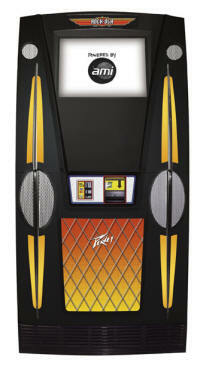 Downloading Jukebox with audio by Peavey - Now Powered by AMI! The Wall-Rock-PV is small in size with big features. High Intensity Tri-Color LED’s mounted behind translucent lexan panels allow Wall-Rock to show a rainbow of colors. The new sound system includes a SyberSonic 4 channel Pre-amp and a Peavey 900 Wrms power amplifier. The Power Amplifier can easily be upgraded to 1,500 Watts or 2,600 Watts RMS for the largest locations.